How to talk to your kids about child sexual abuse. The book helping parents talk to their children about sexual abuse. There are so many difficult conversations parents have to face with their children. When you consider all the topics we are meant to confidently navigate such as child sexual abuse, the end of the world, why they can only eat two biscuits at a time and why bad things happen, they make the old Birds and the Bees talk seem pretty easy. We may not be able to reassure our children about the end of the world, biscuit limits and why bad things happen but one thing we can do better is talk to them about how to protect themselves from sexual abuse of any kind. It took an ex-policewoman and mother-of-three to figure out exactly how to approach this confronting subject with our kids in a way that is child-friendly, non-threatening and easy to learn. That’s because she has been witness to some horrific incidents of child sexual abuse during her time as a policewoman, and those experiences made her determined to protect no only her children, but all children, from predators. One in five children will fall victim to sexual abuse before they turn 18. That is a horrific statistic. The Motherish spoke with Kate and asked her why she felt a book like this was needed and she said it’s because we aren’t open enough with our children about sexual abuse and everyone, parents and schools, need to do better. She says her children aged 12, 11 and seven were their guinea pigs for the book and are now well-versed on how to protect themselves from child sexual abuse. “We talk to them about this subject as you would expect – openly, honestly and regularly. Since we’re both working on it, they don’t have much choice,” she said. Her husband Rod – a corporate educator who partnered with Kate to write the book, agrees that we all need to be more open when it comes to talking to our children about child sexual abuse. “Everyone needs to be more open about education in this area! Schools have a large part to play but just like all other education, it is most effective if what schools do is reinforced by parents and carers at home. One of the main reasons we are seeing an increased prevalence of child abuse is because we haven’t been open about the subject. Offenders use our silence as a weapon to keep their victims under control,” Kate went on. Kate says many parents try and avoid the subject and with good reason. It’s scary. However as long as it is done in a non-threatening way, it can only benefit our children to discuss it. “We know it can be personally confronting, and parents want to allow their children to remain innocent, but that creates the conspiracy of silence around the issue. That’s why we’ve made My Underpants RULE! in the way we have – it allows kids to learn in a positive way, keeps their innocence intact and provides a clear pathway for action before, during and after any issues they may encounter,” she adds. Kate and Rod Power say their children know the message of the book better than they do. Image supplied. Rod says there&apos;s no such thing as mild sexual abuse when it comes to the effect it has on the child. "Justice Fitzgerald of the Royal Commission recently commented that they are seeing no real correlation between the severity of the abuse and the level of trauma for the victim," he said. "This is why we need to open our eyes to how prevalent the issue has become." We asked Kate about the grooming process, and why sexual predators are so successful and gaining access to victims, and she admitted that even she has been fooled by them. "My own experience tells me we aren’t - even as a former police officer I have been fooled. Paedophiles are some of the most clever offenders because they know we all want to trust each other. That’s what they play on. That’s also why we need to teach children to protect themselves, as well as stay aware ourselves. We can&apos;t be with them all the time," she said. Rod says the best way parents can use the book is to just read it with them once or twice a months and encourage them to say the words along with you. "Just like any other children’s book! Read it with them once or twice a month and encourage them to say the Underpants Rule along with you, or even better by themselves. It also contains a &apos;game&apos; within it - five questions - so play the game with them and reward them for a good answer. We find that the more you read it with them, the easier it is to discuss this and other tricky topics with your child," Rod said. 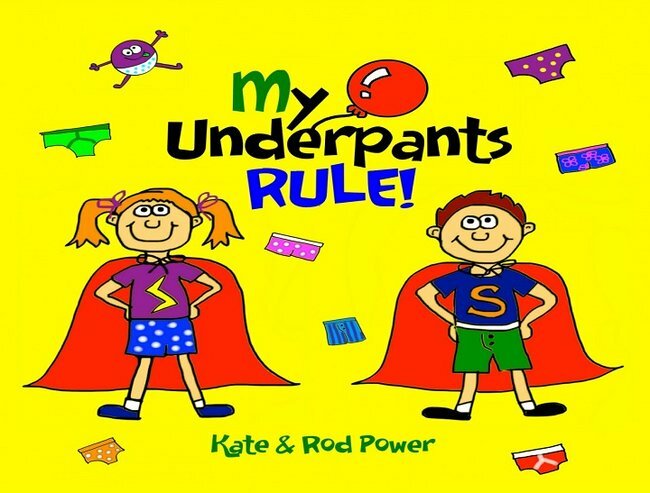 To get your copy of My Underpants Rule and access other helpful resources, visit myunderpantsrule.com.